Megalodon is an extinct species of shark that lived approximately 23 to 2.6 million years ago, during the Cenozoic Era (early Miocene to end of Pliocene). The taxonomic assignment of C. megalodon has been debated for nearly a century, and is still under dispute. The two major interpretations are Carcharodon megalodon (under family Lamnidae) or Carcharocles megalodon (under the family Otodontidae). Consequently, the scientific name of this species is commonly abbreviated C. megalodon in the literature. Regarded as one of the largest and most powerful predators in vertebrate history, C. megalodon probably had a profound impact on the structure of marine communities. Fossil remains suggest that this giant shark reached a length of 18 metres (59 ft), and also indicate that it had a cosmopolitan distribution. Scientists suggest that C. megalodon looked like a stockier version of the great white shark, Carcharodon carcharias. Platybelodon was a genus of large herbivorous mammal related to the elephant (order Proboscidea). It lived during the late Miocene Epoch in Asia and the Caucasus. Platybelodon was very similar to Amebelodon, another, closely related gomphothere genus. Due to the shape of the two lower teeth, in common with many gomphothere genera (such as Platybelodon, Archaeobelodon, Konobelodon, and Amebelodon), they are popularly known as "shovel tuskers." 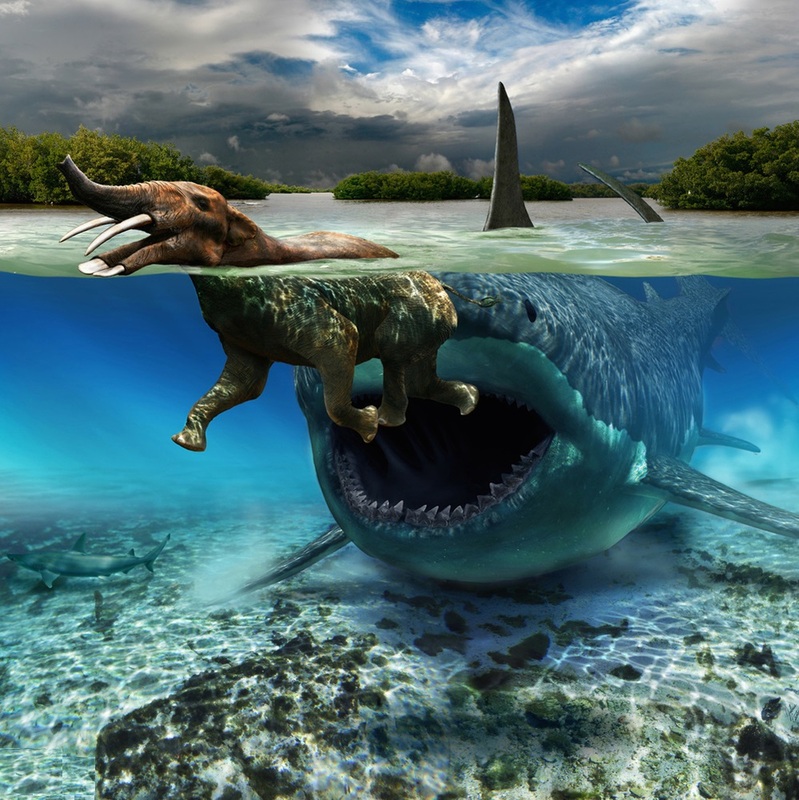 Platybelodon was previously believed to have fed in the swampy areas of grassy savannas, using its teeth to shovel up aquatic and semi-aquatic vegetation. However, wear patterns on the teeth suggest that it used its lower tusks to strip bark from trees, and may have used the sharp incisors that formed the edge of the "shovel" more like a modern-day scythe, grasping branches with its trunk and rubbing them against the lower teeth to cut it from a tree. Adult animals in particular might have eaten coarser vegetation more frequently than juveniles.